Acid Witch has always had a humorous side to their music, but their latest absurdity takes things even more over the top than usual as they pay tongue-in-cheek homage to their Z-rated horror movie influences. Here on the Midnight Movies EP, they provide soundtrack songs from four 1980s horror flicks that influenced them. This album proves that moralists of the 80s were completely right when they said what sort of influence listening to heavy metal and watching low-grade horror movies would have on impressionable youth -- fortunately for the metal-listening public. Fans who are used to the band's usual "Swamp Thing" vocals are in for a surprise, since in keeping with the 80s pop-metal sound of the originals, the vocals are 50% death vocals, 50% a rather rough-voiced rendition of the original vocals -- the latter making it hard for me to tell exactly where Shagrat and Slasher Dave end and where samples of the original begin. I'm Back is a little more funky a song than the band's usual steamroller treatment would be comfortable with, but they acquit themselves well in it. Acid Witch's inveterate fascination with samples have all manner of them popping out at random through the tracks like cheap scares in a Halloween funhouse, with as many 80s horror movie staples thrown in as they can. The samples from the movies, never any good to begin with, are now so dated that even the most serious-sounding lines will elicit a chortle, but mixed in with the comedy is the musical ability we know and love. The crushingly heavy chugging guitar riffs and their creepy Hammond organ sound on After Midnight (the movie, incidentally, guested Ozzy Osbourne and Gene Simmons) and Soldiers of the Night definitely lend the hybrid vibe of Witchtanic Hellucinations mixed with the much milder, poppier "heavy metal" songs of the era. The downside of this album is that its quirkiness doesn't translate to any more long-lasting enjoyment than the popcorn one consumes at one of these movies. It's fun to listen to and most Acid Witch fans are going to enjoy it -- I did -- although it doesn't seem to me that it'll last a long time in anyone's playlist. 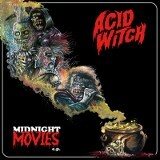 Like the rest of Acid Witch's discography, Midnight Movies is an expendable thrill that you will enjoy and then forget about...until the sequel appears in second-tier theaters near you.